Hi ladies! Congratulations on this exciting programme! First up, where did the idea for Khwela come from? We receive tonnes of CVs, yet we always struggle to find enthusiastic recruits who are ambitious and have the right set of skills for our industry. In South Africa, we also have a problem with youth unemployment, and so that’s where we come in - we thought we could close those gaps. 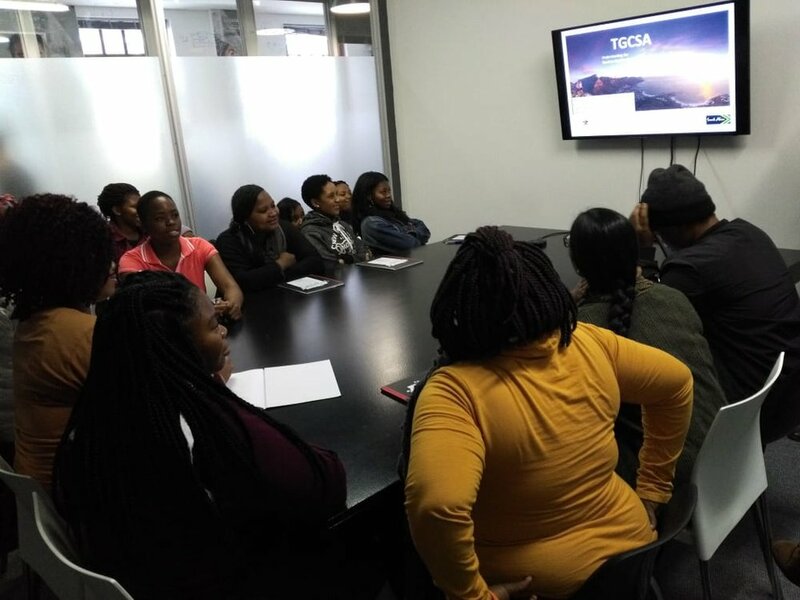 We want to upskill and develop young South African women, and place them with businesses that are complaining about a shortage of skilled candidates, who will hopefully take these young women on full-time. The three of us are passionate, and love the youth tourism industry - it contributes to the country’s GDP, and while it has a healthy number of females working in it, as you go up to management the numbers of females decrease; on an executive level, only 4% of jobs in the whole South African tourism industry are held by women.With the skills and development lessons that the Khwela Youth Tourism Stars will acquire through our Learnership programme, they’ll be confident to stand up and stand out when applying for open positions, and won’t be afraid to aim for a seat at the table. It sounds incredible! Did any of you come in with experience in running a not-for-profit? On top of all working with Once Hostels in South Africa, Asanda is also a qualified social worker, Yotando a qualified tourism practitioner, and Kim a successful business owner, but none of us had any experience with a non-profit organization. However, we are three ambitious women who don’t believe in limitations, and are passionate about helping women and sharing our love of the tourism industry, so we knew it would work. What an inspiring start to the programme, to have the backing of a huge business like Booking.com! So how is Khwela doing now? What’s already been done, and what are the next steps? The first steps were to invite people to apply for the programme. We sent out posters through social media (Facebook and Whatsapp), our website, word of mouth and other communication centres. We then called the candidates to interview them and to make sure that they adhered to the requirements of the programme, before we invited the remaining candidates to a three-day boot camp, where we tested their confidence, intellectual and communication skills, team work coordination etc. At each step, we narrowed down our applicants, until we were left with 22 outstanding ladies who are currently in their two-month Learnership phase. This is an intense online learning module through a Swiss-accredited hospitality course, Lobster Ink. We also have industry role models coming for talks each week to motivate and engage the students, and they have surprise excursions where they go and experience youth tourism themselves. You mentioned that you all work for Once Hostels, but also have other strings to your bows as well. Can you tell us a little bit more about what each of you do at Once, and your career paths to date? Asanda is a Duty Manager at Once in Capetown, as well we a qualified social worker, while Yotando oversees HR for Once, and is a qualified tourism practitioner. Kim is the owner of Once in Capetown and Once in Joburg, and is a qualified marketing practitioner. Apart from working at Once, we also have in common that we are highly driven women, passionate about female empowerment and youth tourism. We struggled to find the right fit for employees at our company, and we all believe that being behind a desk for three years doesn’t necessarily earn you entry into the industry, but practical skills and personality does. That is where Khwela comes in, and why it was started. We believe in learning through experience, and that is where all our current success was built from. You’ve mentioned a few times that you’re all passionate about the travel industry – I think most people reading this probably are too! What is it about the industry that draws you guys in? We love that this is an industry where you get to meet a lot of open-minded people, who are on a quest to explore new adventures, making friends from all over the world and connecting all the countries together. We also believe that the travel industry is where easily accessible skills can transform the lives of previously disadvantaged South African women, providing a sustainable and profitable income for millions of young women. Proof that the right amount of drive and passion can achieve amazing results! You received a grant from Booking.com to start the programme off. How did you find that process of applying for funding? It was challenging but enlightening at the same time, because it was new for all of us.We had to sort out all the paperwork from our side, but the admission process was not challenging.We had to prove that the company was legitimate, and existing through registration certificates and a business profile.We had to submit our business plan, and undergo due diligence, before a telephone interview where a panel of interviewers asked further questions about the organisation, which went well.Kim was then invited to accept the cheque in Amsterdam – one of our happiest moments, with the reality kicking in that we were now going to change the world 20 women at a time. 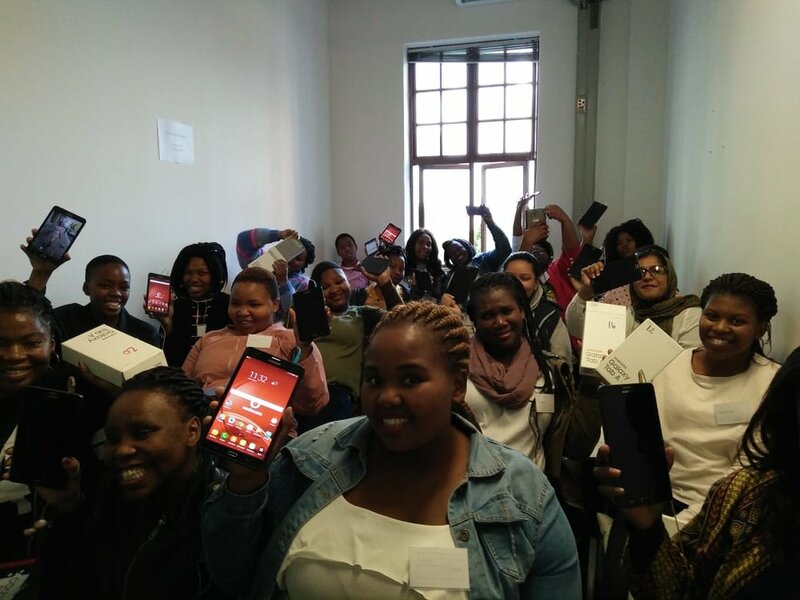 Above: The Khwela Youth Tourism Stars receive their Samsung Galaxy tablets. What an amazing experience, to be able to take that three-week trip through South Africa as part of the training! There are obviously a lot of incredible opportunities for the ladies taking part. What’s the most rewarding thing for you guys about working on this project? The most rewarding thing is being able to create an environment that will help these young women become empowered through tourism. Watching their passion, dedication and determination to learn more and grow is a huge reward on its own. Some of them come from disadvantaged backgrounds, and have no employment experience, but they are willing to work hard to achieve their goals through this project, and for us, that’s the best reward ever. That does sound rewarding! On the other side, what’s the most challenging thing? The only challenge we’re currently experiencing is finding out feet – normal stuff that start-ups go through when they’re still in the stages of testing everything out to see what works and what doesn’t. The Learning stage of the programme is totally dependent on fast Internet, and that has caused a bit of a delay in the programme, forcing us to look at increasing the speed of the connection or changing the training venue in the upcoming months. Left: Learning in the classroom. Well said! With that in mind, where do you hope Khwela will be in five years’ time? How about in 20? We’d love to see Khwela becoming a recognized and respected institution in the youth travel community, as a hands-on learning approach that delivers tangible results, and leaves employers in the youth travel industry with one less stress to worry about. We hope to expand to different provinces and even different countries. So for all those future leaders you’re creating, what’s the best piece of advice you ever received with regards to your career in tourism? Who gave it to you? An interesting thought! And if you could have dinner with any woman, living or dead, who would it be and why? It would have to be Mama Winnie Madikizela Mandela. She did not have anything, and was a stubborn black woman during apartheid who still managed to be a mother not only to her family, but to the nation through her beliefs and her determination not to let any barriers deter her from the future she saw for her family and country. Great answer. I think we’d all love to have dinner with her. And so finally, to wrap it up, what do you think is the single most important thing we can do to help more women climb the hospitality and tourism career ladder? Every time you make that climb, do it with a woman, and if it can be one or two women at a time, the chain will grow. Ironically, Khwela means “to climb”, so it is at the essence of what we believe in! Too many women pull the ladder up after they have succeeded – we want to share our success and get other women onto the climb! Well said! Thanks so much for your time Asanda, Yotando and Kim, and we look forward to hearing more about the great work Khwela is doing!